The mantra espoused by Eadie Chapman (Jean Harlow), “The Girl from Missouri” herself, is familiar and it goes like this: “I want be somebody.” Emphasis, of course, on the “be” – I want to be somebody! – which Harlow, bless her eternal soul, sells with all the verbal va-va-voom she had at her mighty, mighty disposal. In this case, however, being somebody has nothing to do with becoming an actress or a singer or a doctor or a lawyer or an aviator. No, being somebody means finding a rich dude and marrying him. Not, mind you, that Eadie is a mere gold digger. After all, the movie opens with Eadie and her best friend Kitty (Patsy Kelly) escaping the Show Me State and one of those outfits that in kinder, gentler Hollywood is a brothel but isn’t, labeled a “beer hall”, or something, instead, like the New Congress Club of “From Here to Eternity” where Donna Reed was merely a (cough, cough) hostess. Eadie has spent a lifetime of being taken advantage of by men and so Harlow plays straight to this idea, emitting the air of a woman who’s going after what she’s cosmically owed. What she’s owed becomes entangled in something like a misshapen love triangle that unfolds as the action moves from Missouri to New York to Palm Beach where Eadie makes eyes at a self-made millionaire T.R. Paige (Lionel Barrymore) even as Paige’s son Tom (Franchot Tone) makes eyes at Eadie. She initially doesn’t want anything to do with Tom except that T.R. doesn’t want anything to do with her, and so when Tom persists in his courtship, she feels herself starting to fall for him, one of the strands of story that feels less than convincing. If anything, Tom’s pursuit of her is over the edge. Indeed, if Eadie seems to believe she’s cosmically owed, Tom has the same idea for himself, insistent that she reciprocate his feelings even as she herself insists he offer a wedding proposal rather than a mere roll in the hay. This was the dawn of post-code Hollywood and so it’s easy to wonder what a pre-code “Girl from Missouri” would have liked, whether or not Eadie would have withheld you-know-what from Tom or whether that really was the intent of the movie all along. 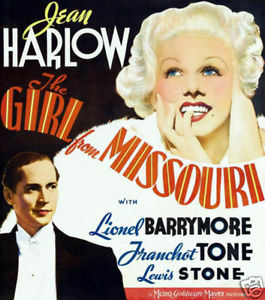 Still, it is notable in the way she stands up her for herself, which all of Harlow’s patented platinum blonde feistiness was made to evince. Not that Harlow does not also communicate something real. Look no further than the bordering-on-disturbing scene in which Tom, determined at his father’s suggestions to pull the mask back on Eadie’s gold digging intentions, essentially tries to force himself on her. All of Eadie’s talk about being somebody informs this moment in a brilliant way as her fears of not really being anybody, of simply being a woman for whom she is no good except how men can exploit her and her body, pours forth as she tries to call him off. Harlow had a way of turning from a barrel of tornadic fury to trembling vulnerability in an instant and she manages that feat here as well as she ever did, emotionally crumbling right before our eyes and before Tom’s eyes too. She has fallen for him, and in the wake of this scene, he falls for her too, a mutual affection that cannot help but feel narratively hurried in light of what has just preceded it.